Feed your skin with this nourishing serum, rich in omega fatty acids, potent antioxidants and skin-restoring ceramides. The light, lotion-style serum instantly replenishes, repairs and strengthens the skin’s natural barrier, for healthier, younger-looking and more supple skin. Great for dry, dehydrated skin that has lost its vitality. I LOVE this serum. It was recommended to me by a Paula’s Choice product advisor for my very very dry skin, and since it’s not one of the PC products I tend to hear much about, I was a little skeptical, but it is a BEAUTIFUL serum. I use it over BHA 2% gel exfoliant and top off with the Resist Intensive Repair Cream (and sometimes a little vaseline just to really lock everything in for the cold dry nights here in Finland), and you can tell the softening, replenishing effect almost immediately. Could not say enough good things about this serum. Elena - Wanted to love it but.. I've been using it for a month and now to substitute my day time omega facial oil (cause it's been too greassy for day time use) and have already noticed changes. Really great basic serum (the good "complete" kind of basic) to strengthen skin barrier. Much more suplle skin, just looks more normal, really healthy and super moisturised, but not heavy at all. It sinks in completly but gives a moisturised invisible feeling. It's amazing, I can't imagine not having this in my routine anymore, I'm glad I bought two at once. This is a great serum for all skin types! I have combination, sensitive skin with pores and i use this serum every night before moisturizer. I use only two pumps for my entire face, eyes and neck as it can be slightly greasy sometimes if you apply much. My skin is softer than ever! Especially in the morning, i wake up and my entire face glows! I notice even my eyes glow despite being exhausted from work. Day after day, my skin is getting more radiant than i have ever experienced! Highly recommended! This one is truly a goldmine of fantastic ingredients! It’s my new HG! I use it either as a serum or alone as a lotion, whatever you want and need it to be. It’s lightweight yet very hydrating, the ingredients with all the ceramides and hyaloronic acid and fartyg acids. It’s a dream come true for my tired, thirsty face. Thank you Paula! I have used one package of this. Now I don’t have it left and have noticed that I miss this one. I alternate serums (for example with Resist retinol serum) so I didn’t use it every night. This feels moisturizing, soothing and nourishing. It helps to get rid of occasionally flaky skin that I can get with using retinol and BHA. It still isn’t greasy and seems to fit my oily skin really well. I don’t necessarily need a moisturizer after this everytime. It can also be mixed with a booster or oil very well. I miss the feeling and easiness of using this so I need to by this again. Fabulous texture spreads easily this makes my skin feel so supple and soft even at the end of a long day in work with heating on full blast i notice when i don't use this for a couple of days my skin starts feeling tight and uncomfortable by end of day. I highly recommend. I didn't really think that this serum made very much of a difference, but then I ran out of it and suddenly I noticed that my skin was becoming really dry again and getting red and irritated much quicker. So I am definitely repurchasing this serum for my dry and sensitive skin. It is a very lovely texture and feels great and soothing on the skin without making it greasy and I find that one pump is enough for the entire face. Great packaging as well. This is one of very few products that have made a noticeable difference in my skin. I find it calming and soothing. It's very comfortable to apply and wear. No smell to speak of. The serums I used before weren't bad, simply insufficient. This one is a game changer for me. My skin doesn't hurt anymore and it feels much stronger. At first I was a little hesitant to try this because I wasn't sure I would notice much difference. My skin is pretty normal with a little bit of acne (despite going trough a course of prescription retinol) and I wanted a serum that would help balance my skin barrier and just generally make my skin look a bit healthier and even-toned. I have been using it for two months now, combined with the Skin Balancing toner, AHA exfoliant and niacinamide booster, as well as cleanser, azelaic acid and moisturizer + sunscreen from another brand. My acne hasn't improved, which I didn't expect either, but my skin feels much more elastic, thicker and healthier. It's difficult to explain but my make up goes on much smoother and my complexion looks better in the afternoon/evening than before. I have now started combining this serum with the 1% retinol booster. Eventually I'd like to add the new C15 booster which I have been waiting for for years. I will definitely continue with this, especially as I am using retinol now. I bought this serum because it contained the three type of ingredients I am looking for: ceramides to restore my skin's barrier, essential fatty acids to nourish and moisturise and antioxidants to protect against external damage. And it really works! I have used this serum for a month, in both warm & humid as well as a cold & dry climates - and it works extremely well for me. I have even used it in combination with PCs self-tanning concentrate (2 pump serum + 4 pump concentrate), which always used to dry out my skin when used with other serums or moisturisers, but this one just delivers! I have dry and sensitive skin, and with this serum I no longer need a moisturiser, just a drop of oil on my cheeks after the serum (and SPF if/when needed). I couldn't be happier, and will surely repurchase! I have been using Omega Serum for more than a month as a serum and an eye cream (lightweight enough not to cause milia) and I am very pleased by how much comfort/moisture it brings to my dry skin. It also helped repair my skin barrier after a week of skydiving. Will definitely repurchase. Ellbxl - Light weighted quality serum ! I have been using the serum for 2 weeks now, it is maybe too early to jump in to conclusions about it's effectiveness but when do you know when a product is really a good fit? As with all Paula's choice products, I only had very good results so I'm confident in this one. I feel this serum works really well for me, I have mixed skin and that's why this serum is perfect: it's very light weighted, texture is silky and it has a neutral scent. I use it after cleaning and exfoliating, in the evening. So I can recommand this serum. Unsaturated omega-6 fatty acid found corn and sunflower oils. Used as an emollient and is effective as a skin-restoring, an antioxidant and as a skin-soothing agent. Resist Omega+ Complex Serum is ideal for anyone struggling with dry, dehydrated skin that’s showing signs of fatigue and visible signs of aging such as fine lines and wrinkles. Also excellent for those with sensitive or compromised skin. Resist Omega+ Complex Serum is a nutritional powerhouse for dry, dehydrated skin that’s showing signs of fatigue. Light in texture but heavy on beautiful results, this ceramide- and omega oil-enriched serum visibly hydrates, rejuvenates, and softens skin from the first use. 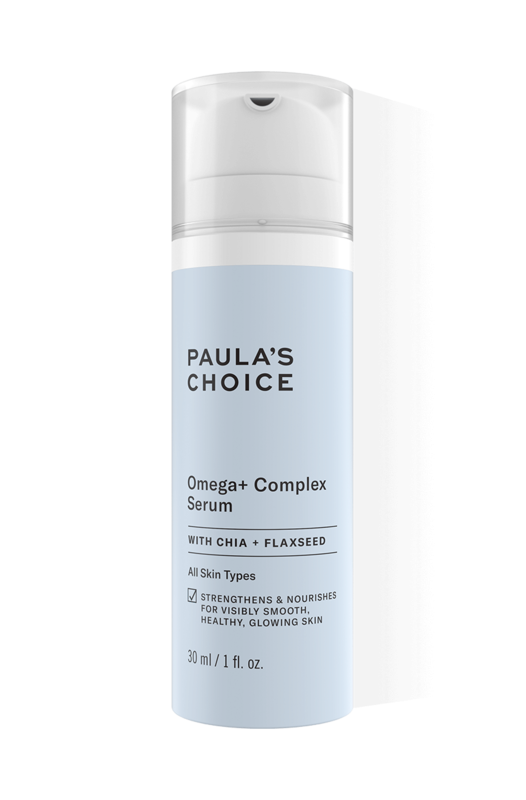 It’s the only Paula’s Choice serum that contains a specially selected mix of essential fatty acids designed to restore skin’s vitality and care for its delicate barrier—key to a healthier, younger-looking appearance. Each oil and skin-restoring ingredient in this unique formulation also provides antioxidant benefits, making it ideal for layering with any of our other serums for enhanced results. How does the Omega+ Complex Night Cream differs to the Omega+ Complex Serum? The biggest difference between Omega+ Complex Night Cream and Omega+ Complex Serum is the texture. The Omega+ Complex Serum has a light lotion texture, while the Omega+ Complex Night Cream has a rich, creamy texture. Both products contain the same main ingredients, but the night cream also contains amino acids, non-fragrant plant oils and soothing antioxidants that are not present in the serum. The serum, on the other hand, contains vitamins C and E, a higher concentration of glycerine, supplemented with plum oil as a source of omega-9 fatty acids. These products can be used together and complement each other perfectly.